Wow. It’s mind boggling think about cultures and groups of people that have been uncontacted in our world, living incredibly different lives, away from technology, the industrial revolution, print, the internet, science, air transportation, and everyday things we take for granted. Watch the video above, and read tons more about these uncontacted tribes at UncontactedTribes.org. I’ll mirror a few of the astonishing pictures after the jump. ” Video of an uncontacted tribe spotted in the Brazilian jungle has been released, bringing them to life in ways that photographs alone cannot. The tribe, believed to be Panoa Indians, have been monitored from a distance by Brazil’s National Indian Foundation, a government agency charged with handling the nation’s indigenous communities. 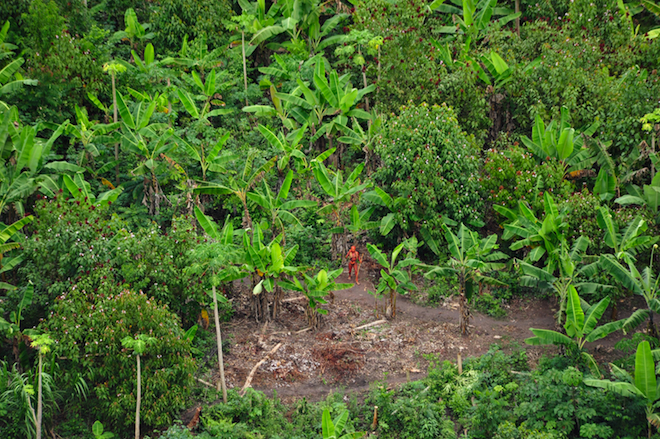 Many of the world’s 100 or so uncontacted tribes live in the Amazon. Until 1987, it was government policy to contact such people. But contact is fraught with problems, especially disease; people who have stayed isolated from the mainstream world have stayed isolated from its pathogens, and have little immunity to our diseases. Brazilian government policy is now to watch from afar, and — at least in principle — to protect uncontacted tribes from intrusion. 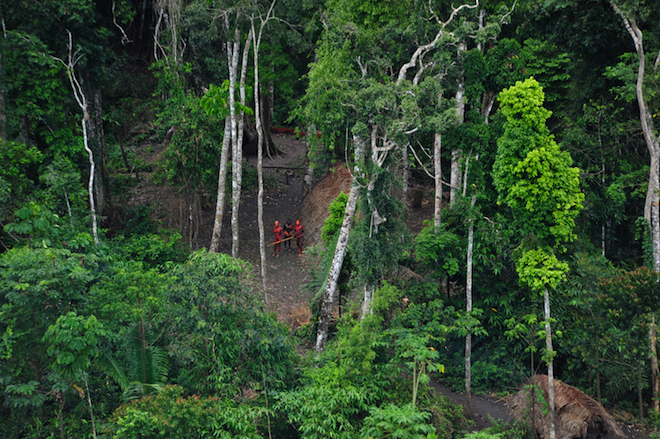 A previously uncontacted tribe has been found in Amazon jungle, with aerial photographs giving a glimpse of people who’ve had no known contact with anyone except their tribal neighbors. Taken by Brazil’s Indian Affairs department, the photographs were released Jan. 31 by Survival International, a tribal-advocacy group. 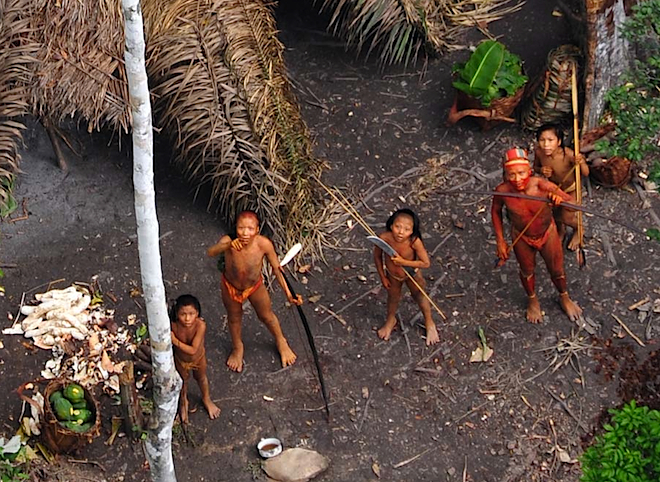 About 100 uncontacted tribes are believed to exist worldwide. They live in remote, resource-rich areas, and are threatened by invasive development. The last such discovery was made in 2008, also in the Amazon. This tribe was spotted at the mouth of the Envira river in western Brazil, not far from the Peruvian border. Judging by their haircuts, the Indians appear to be Panoan, a tribe native to eastern Peru and western Brazil, said Survival International research director Fiona Watson. They’re probably descended from Indians who escaped contact during the Amazon rubber boom of the late-19th and early-20th centuries, a period of near-genocidal exploitation. Though they haven’t had direct contact with the outside world, they’ll know about it. Trade with tribes who have made contact likely explains the machete carried by a young boy at center, and the pot atop a stone below. More traditional is a basket containing papaya at left. Above it is a pile of bitter manioc, peeled prior to soaking. At top right are baskets with carrying straps, with banana leaves used as covers. From the picture, the people appear in good health, said Watson. “These people look healthy. They’re not obese, they’re not thin. There’s not a decrease in the population. The communal houses are still there,” she said. A garden clearing is clearly visible from above. A man painted red with annatto-seed dye can be seen on a path leading to the garden. 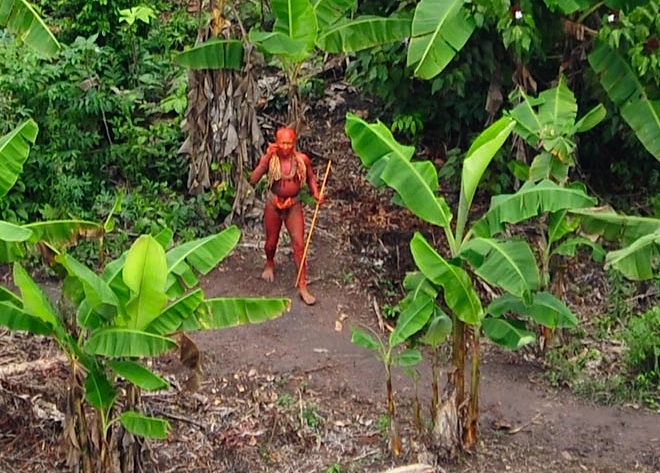 Red paint is a common body decoration among Amazon tribes. “They must feel relatively comfortable to have a settled community with developed gardens and structures, which is good news,” said Chris Fagan, executive director of the Upper Amazon Conservancy, an environmental-and-cultural-conservation group that works in southeastern Peru. Fagan said the photographs are important for providing documentation of the group, an essential step in pushing the Brazilian government to honor laws that promise territorial rights to indigenous tribes. Those laws can be evaded by refusing to acknowledge the tribes’ existence. Fagan also recommended a consumer boycott of Amazonian mahogany, demand for which fuels deforestation of tribal territories. A closer view shows the man in clearer detail, along with details of banana plants and annatto shrubs in the garden. Papaya and manioc would also be grown there, and perhaps cotton used to make bracelets, anklets and hammocks, said Watson. Two men painted red and another painted black look up from their village clearing. Black paint can be either decorative or a sign of hostility, but Watson doesn’t believe hostility is directed at the plane overhead. Thackara and Watson want the public to write the Peruvian government, urging a halt of illegal logging in the Amazon. With logging, ranching and mining come foreign diseases and the destruction of forests on which tribes rely. 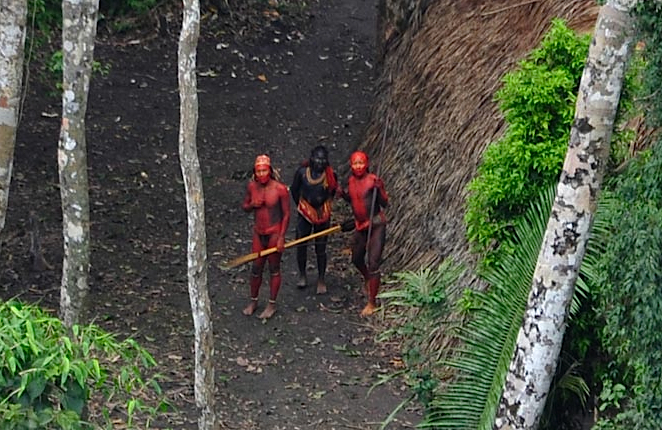 Some uncontacted people have fled from Peru into western Brazil, where this new group was spotted. Thackara emphasized that the tribes deserve protection not as living examples of Stone Age life, but as rare and distinct cultures. This entry was posted on Saturday, February 5th, 2011 at 2:03 pm	and is filed under entertainment, experience, information, inspiration, materials, tech, thoughts, wacky. You can follow any responses to this entry through the RSS 2.0 feed. You can leave a response, or trackback from your own site.